A lore of many tribes of Alta and Baja California Cougar was walking in the forest, and he jumped onto a fallen log to look around. From inside the log came a tiny voice. “Let your cousin come to this place tomorrow, when the sun is high, and we will see who is the mightier,” said Cougar. “If your cousin does not prove himself to me, I will crush you and your entire lodge with my paw!” Cougar turned and bounded off through the forest. The next day, when the sun was high, Cougar came back along the same trail. Just then, a tiny mosquito flew up from the log buzzed into the big cats ear. “What is this?” cried the cougar, who had never seen or heard a mosquito before. 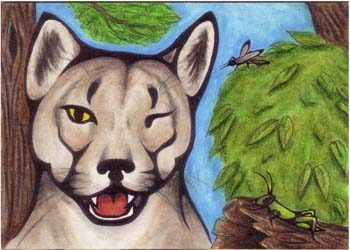 The mosquito began to bite the soft inner ear of the cougar, and drank from his blood. “Ahrr! Ahrr!” cried the cougar in pain, “Get out of my ear!” The cougar pawed at his ear, and ran around in a circle shaking his head. The mosquito bit him again and again. Cougar said that he would so Mosquito came out of Cougar’s ear and went into the log lodge with Cricket. Cougar ran off down the trail, and never went that way again.